Colonization puts you in the role of Viceroy of the New World. You are sent by your King and country to establish colonies in the newly-discovered Americas that lie to the west. You face many of the same challenges that faced colonial organizers of the time-competition from other Old World powers, strange native cultures, the problems of establishing profitable trade programs, and the problems of organizing an army from a rag-tag band of colonists. 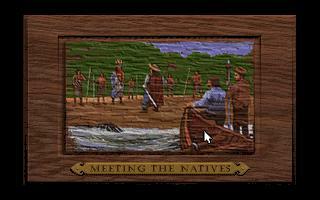 The game begins with the European discovery of the Americas (1500) and continues until approximately the time of the American Revolution (1800). In the beginning of the game you are given a trading/exploration ship and a small group of colonists. You have no knowledge of what lies ahead of your ship, so you must explore until you find a suitable spot to lay down your first colony. As your colonies grow larger and larger, you inevitably encounter native populations and are confronted with competing imperial powers from the Old World. To be successful in Colonization, you must balance your need for military might with your need for essentials. You must decide early what your strategy is and pursue it relentlessly, but be flexible enough to adjust to a changing situation. It is very important to have a consistent policy with the natives, because your handling of those relationships are critical. Finally, you must build a colonial society that has the infrastructure to survive a test by fire-the War of Independence. In Colonization, you have the chance to change history. As a colonial power, you decide the policies, you make the plans, you choose what is important and what is insignificant. Finally, you will be called upon to decide when to declare independence from your mother country.